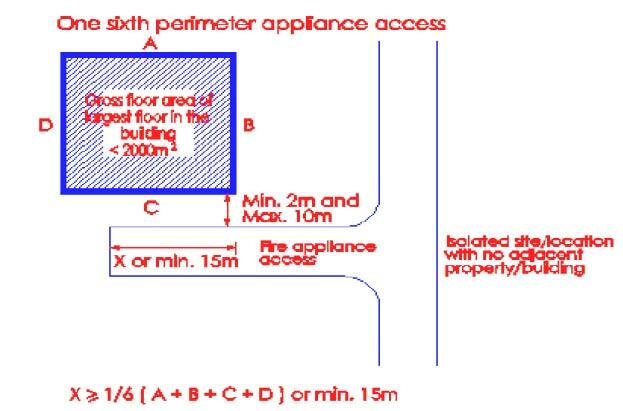 1.1 4m-width firefighting appliance access/access road to the building shall be provided and the gradient shall not exceed 1: 8.3. 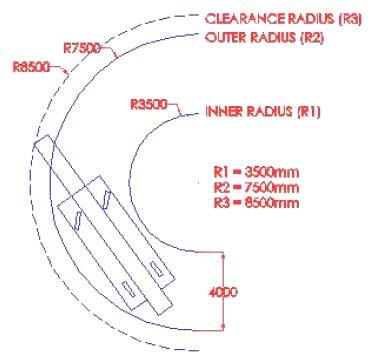 The angle of approach and departure for any means of access road shall not exceed 1m drop in 20m. The access road shall able to sustain the stationary load of a 24-ton fire appliance. 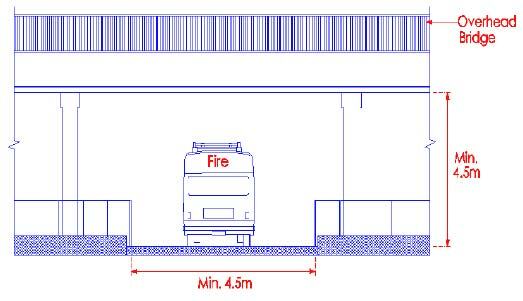 In addition to access road, fire engine hardstanding of 6m x 15m (minimum), with longer side parallel to the façade of the building shall be provided. The hardstanding shall withstand the stationary load of a 45-ton fire appliance. 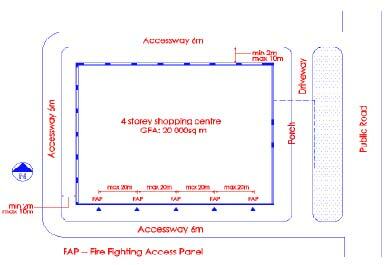 Access opening shall be provided along the external wall of building fronting the fire engine hardstanding to provide access to the building for firefighting and rescue operations. 1.3 Hardstanding is not required for residential building such as bungalow. Semi-detach and terrace houses regardless of building height. 1.4 For landed residential development with shared communal facilities, there is need of firefighting appliance access road. 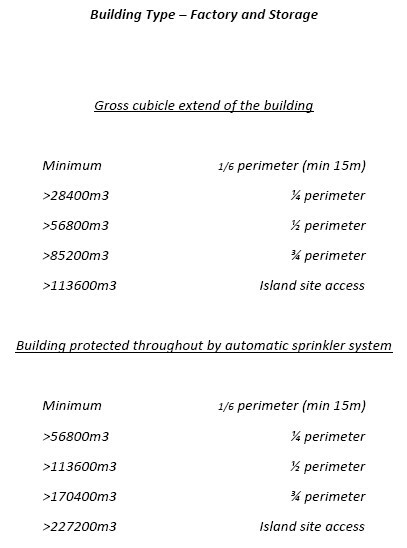 The maximum travel distance from the fire engine pump appliance to every point on the project plan area of any building shall be 60m. 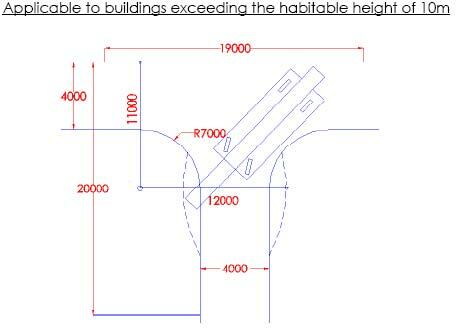 1.5 For residential building exceed the habitable height of 10m, fire engine hardstanding shall be within 18m of the breeching inlet. 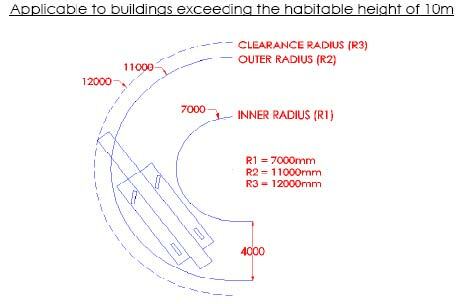 The breeching inlets shall be located on the external wall above ground level nearest to the vertical run of the riser stack. 1.6 For building for institution, office, shop and places of public resort with habitable height not exceeding 10m, fire engine access road shall be provide within a travel distance of 45m from every point on projected plan area of any building. Length of fire engine hardstanding shall be provided based on the gross floor area (including toilets, stores, circulation areas, etc.) 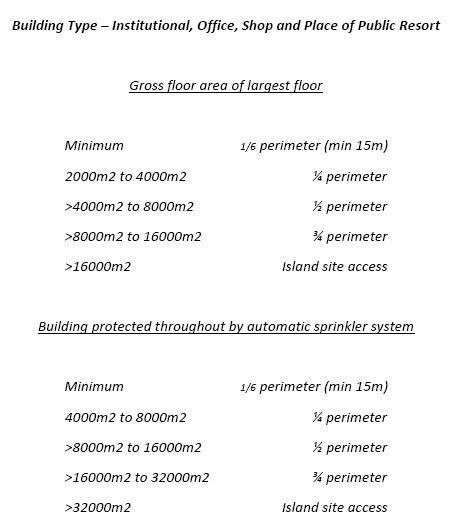 of the largest floor in the building for institution, office, shop and places of public resort with habitable height exceeding 10m. 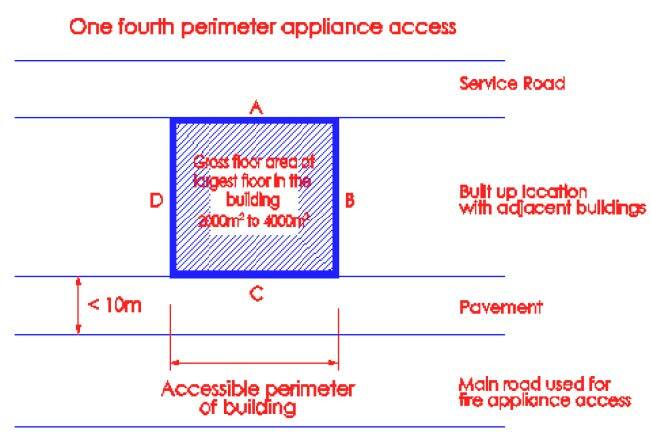 Please refer to Table A, for required length which is in term of the building perimeter length. Different building types have different requirements. 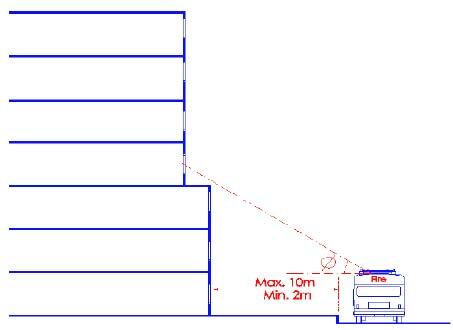 1.10 Fire engine hardstanding shall be positioned so that the nearer edge shall not less than 2m or not more than 10m from the centre position of the access opening, measured horizontally. 1.11 Fire engine hardstanding shall be laid on the level platform or if on an incline, the gradient shall not exceed 1:15. 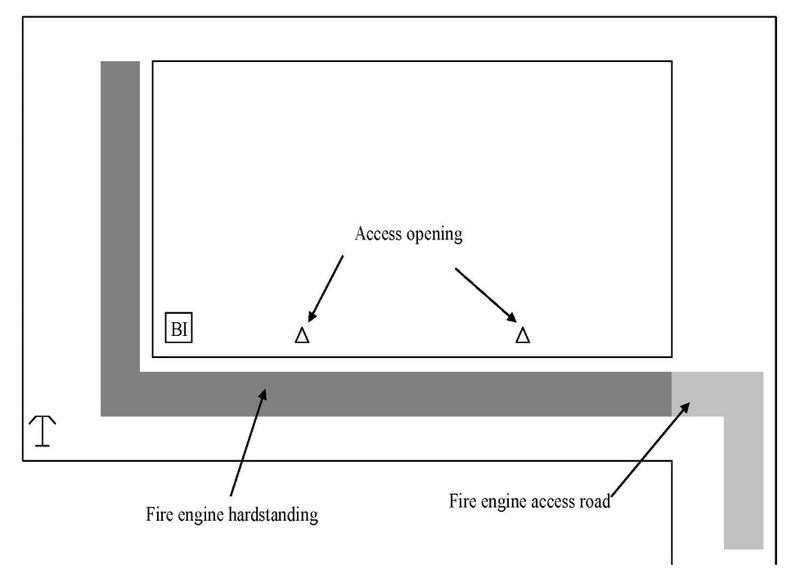 1.12 Fire engine hardstanding and access roads shall have an unobstructed vertical clearance of not less than 4.5 m.
1.13 Public road can serve as fire engine hardstanding provided the location of such public roads is in compliance with the requirements of distance from access opening. 1.14 Fire engine hardstanding and access road shall be kept clear of obstructions and other parts of the building, plants, trees or other fixtures shall not obstruct the path between the fire engine hardstanding and access opening. 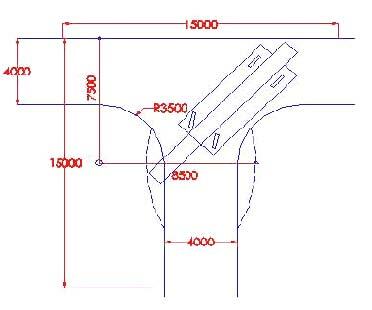 1.15 The inner radius of turning facility for the fire engine hardstanding and access road shall be minimum 3.50m and 7.0m respectively. 1.16 Dead-end fire department access roads in excess of 46 m in length shall be provided with approved provisions for the fire apparatus to turn around. 1.17 All corners of fire engine hardstanding shall be marked. 1.18 Marking of corners shall be in contrasting colour to the ground surfaces or finishes. 1.20 Side post displaying the wordings ‘Fire Engine Access – Keep Clear’ shall be provided at the entrance of the fire engine hardstanding. Size of wordings shall not be less than 50mm. 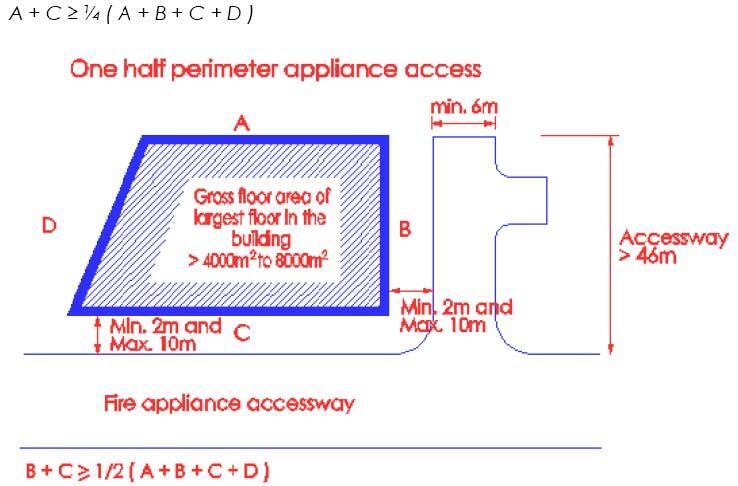 2.1 Access opening shall be spaced not more than 20m apart measured along the external wall from centre to centre of all access openings. 2.2 Access shall include unobstructed external wall openings, windows, balcony doors, glazed wall panels or access panels. Windows, doors, wall panels or access panels must be readily operable from the inside and outside, unless fitted with breakable glazing. Inside and outside of access openings shall be unobstructed at all times during the occupancy of the building. 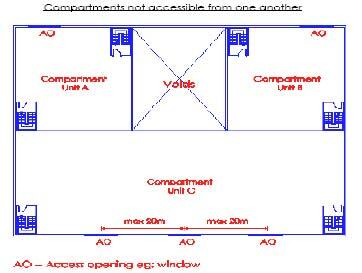 2.3 An external wall which face the fire engine hardstanding and is windowless or a blank wall shall be provided with access opening at each storey. 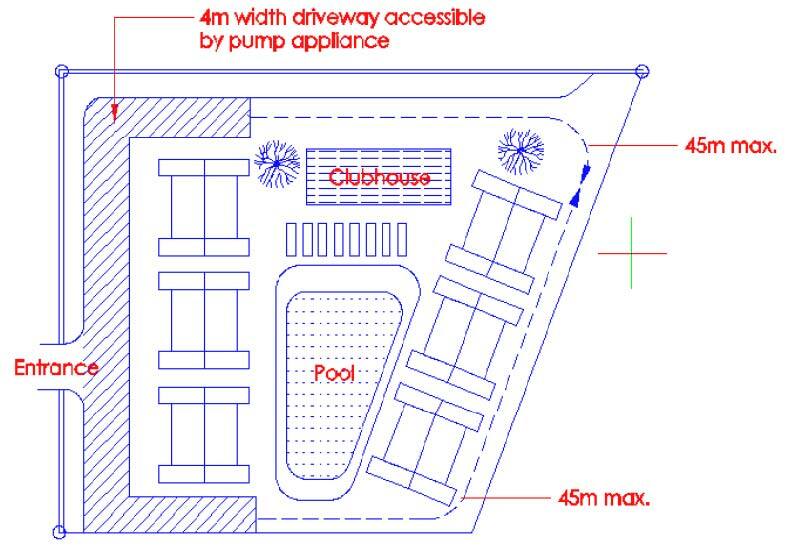 2.4 Access opening shall be note less than 850mm wide by 1000mm high with sill height of not more than 1100mm and height not less than 1800mm above the inside floor level. 2.5 Panels to access openings shall be posted with either a red or orange triangle of equal sides (minimum 150mm on each side), which can be upright or inverted, on the external side of the wall and with wordings “Fire Fighting Access – Do Not Obstruct” of at least 25mm height on the internal side. 2.6 Buildings and construction regardless of occupancy except factory and storage, having a habitable height of 10m or less, shall be exempted from the requirement to provide access opening.